Exercising and eating healthily have become an integral part of people’s daily routine. More and more Americans and individuals all over the planet are doing all they can to stay in shape. Driven by that, the fitness industry has been trying to keep up with the demand. The outcome has been an unprecedented availability of fitness equipment. One of the most widely used and recognized are spin bikes. These stationary indoor cycles have become the favorite of many for some reasons. But some of them can be very expensive, running into the thousands while also taking up too much space. Others don’t often live up to an individual’s expectation or fail to deliver what they promise. Also, due to large demands, there are now more spinning at home bikes than ever before. In turn, this makes choosing or finding the right one a daunting task, especially for people who are on a budget and do not want to spend thousands of dollars. The best way around this and other relevant issues is by knowing all you can about them. That includes superior spin bikes on the market which cost less than $500. Why Are Spinning Bikes For Home So Popular? Indoor cycling bikes are all the rage popping up at every turn. You can see them in commercials, TV shows, mainstream movies and in almost every fitness club or gym. Does this leave many wondering why exactly these stationary bicycles are so popular? What is their appeal and do they work? Spinning bikes and their usage is so rampant due to several reasons. For one, they are fun and can be used as a group, alone, at a spinning class or home. Second, the indoor cycling machines are excellent for workouts since they deliver on so many levels. They can help people burn calories very fast; about 500 in forty-five minutes. There is also their cardiovascular benefits and ability to render light power workouts. Plus, using a spin bike is nearly effortless, and almost anyone can use one. Perhaps their biggest appeal is that some of them take up very little space. Because of that, they can be used virtually anywhere at any time. That includes a person’s home or office since some of them are capable of being stored away easily. Belt or Chain – There are several types of spin bikes. Some are chain drive while others use a belt. The latter is a lot less quiet and requires less maintenance. Belted driven bicycles generally cost a bit more than their chain counterparts. Resistance System – A person can choose between magnetic and mechanical resistance systems. In the same way, belted are quieter than a chain; magnetic resistance is less noisy than rubber mechanism. At the same time, due to design and other factors, magnetic bikes are more expensive than mechanical. Comfort – The chances are that you are going to be using your cycling bike frequently and for an extended period. It is why the support of a spin bike is so crucial. Look for spin bicycles that will make your exercising enjoyable as opposed to one that leads to an unpleasant experience. Keep in mind that in some cases, getting used to your bike may take at least a month. More so when it applies to the seating and your rear end. Durability – Since you will be using your spin bike several times a week, it has to be durable. Check out at home cycles which offer a warranty on parts for a year or longer. Design & Features – There are spin bikes which come full of useful features. Some of them have the option for the seats to adjust sideways, up and down. Besides, the height of the handlebars on the bike can be changed as well. If you need to put your spin cycle away when done, consider transport wheels. Flywheel Weight – The more the flywheel of a spin bike weighs, the higher its resistance level is likely to be. The flywheel mechanism is what mimics an experience of actual bike riding — the weight of flywheels averages between 30 to 50 pounds. Bike enthusiasts of every level appreciate the Sunny Health & Fitness Pro. It is not only practical for indoor use, but it is also priced under $500. The spinning bike is lightweight, yet durable and efficient. Riders will find plenty of useful features on the chain-driven SF-B901 model. Excellent for those who want to attain a great cycling workout from the comfort of their home or office. There is plenty to love about the Sunny Health indoor cycling bike. Out of the box, riders will notice the aesthetically pleasing and impressive design. With a 40lb flywheel, the effectiveness of workouts is maximized. Users will feel as if they are riding a bicycle. Resistance and tension are available via a useful tension knob. Depending on your fitness level, you can choose your range with a quick twist. For comfort, the handlebars and seat come fully adjustable. Chrome solid 40-pound flywheel for added stability. Chain driven mechanism that is reliable, smooth and easy to use. Convenient wheels integrated for transporting and moving the spin bike easily. Handlebars and seat are fully adjustable. Emergency stop brake and adaptable resistance. Crank system is heavy duty, and max user weight is 275 pounds. Inseam height max is adjustable up to 41 in. with a 28.5 in. minimum. One year warranty on the system frame. For added comfort, the seat is lightly padded and adjustable. Easy to assemble, low cost and sturdy construction. Handlebars are padded and capable of adjusting horizontally. No computer display or LCD features. Handlebars can only go up or down. Brakes may squeak somewhat as time goes by. Periodic lubrication may be required. The majority of people who purchased this bike greatly appreciated its price. For under $300, it is hands down a bargain that delivers extensive workouts. At a 110 pounds, the 48.5 x 20 x 46.5 inches Sunny SF-B901 is also compact and transportable. Esthetically, it earns high marks as well as for its effectiveness and deliverables in exercising. The only con is the lack of an LCD for tracking your progress. But some users added their computer display to bypass this problem. Reviews about products are the best way for people to gauge anything they are looking to buy. Based on the testimonials about the Sunny Health & Fitness Pro, there is plenty to like. One user named Michael gave it a 5-star review. He wrote “This bike is rock solid! Loving every minute of it.” There was also one from EGold who stated in his long testimonial “Perfect bike to keep you moving without going anywhere.” A lady by the name of Rebecca was happy to say “Worth every penny…” when speaking about the Sunny spin bike. Burning calories, building lean muscle definition and improving your cardiovascular health can be easily attainable with this spin bike. The Sunny Health & Fitness SF-B1002 is regarded as a top of the line stationary exercise bike. Withholding up to 275 pounds, the steel frame is sturdy and very well designed. The unit uses a 49 pound chromed solid flywheel which allows riders to replicate an outdoor cycling experience. All done from the comfort of wherever you ride the spinning bicycle. Experts on spinning cycles often refer to the ‘Q’ factor of a bike to measure how great it is. The Sunny SF-B1002 has a Q factor of 7.5 inches. That is regarded as very good since then it leads to an effective cycling workout. The spin bike measures 44 x 20 x 44 inches and weighs 115 pounds. As far as the resistance, users will get plenty resembling real-road bike riding. There’s a 40-inch height max with a min 29-inch, and the seat can be adjusted horizontally and vertically. The handlebars can move up and down as well. Convenient water bottle holder built into the frame. Heavy chrome solid 49lb flywheel. The fully adjustable padded seat. For easy transportation, the unit has portability wheels. Workouts are quiet and smooth due to the belt drive mechanism. Both handlebars and seat are fully adjustable. The steel frame is sturdy, and it has a friction pad resistance system. Beautifully designed and takes up little space. Riders are unable to keep track of their workout info since it has no display console. Requires lubrication from time to time to keep resistance pad from squeaking. Not capable of keeping track of resistance levels since it has no indicator. Most people looking to purchase a top-notch cycling bike spend thousands of dollars. However, the Sunny Health SF-B1002 allows folks to get one at a fraction of that cost. While it lacks digital displays and a few other things, it delivers effective workouts. The spin bike’s frame is sturdy and durable while also being visually pleasing. In conclusion, if you are looking for a great stationary cycling bike under five hundred dollars, consider the Sunny Health SF-B1002. There was very little trouble finding five-star ratings about the Sunny Health & Fitness SF-B1002 spin bike. For instance, a person named Jackson stated “Couldn’t love it more – Use it with Pelaton classes,” when referring to his experience. There was also a user named Bob who boasted “Sunny SF-B1002 Indoor bike…. a good purchase decision.” Another testimonial from a verified purchaser by the name of Craig C. was very informative. He quipped “A good solution even for a “serious” cyclist,” in his testimonial. Listings about the best spin bikes for home use generally include the Sunny Health & Fitness Indoor Cycling Bike. In part, it has a lot to do with the cycling bike’s high price, features, and deliverables. Made out of durable plastic and rock-solid steel makes it lightweight and versatile. When it comes to workouts, there’s plenty of resistance and efficiency to gain from it. People who purchase this unit found assembling it to be easy. The indoor spin bike only weighs 107 pounds and measures 44 x 20 x 44.5 inches. Upon climbing on it, riders will enjoy the quiet and smooth ride from the chain drive mechanism. There are a 250 lbs max user weight and an adjustable inseam height of Max 37 Inches / Min 29 Inches. The resistance, seat, and handlebars are fully changeable. You can move up, down, back and forth quickly using the knob twist. All the while, making your stationary bike workout efficient, comfortable and fun. Equipped with two transport wheels for moving spin bike anywhere easily. Sturdy steel frame and heavy-duty crank. Powerful 40lb flywheel with chain drive. Handlebars are thickly padded and adjustable horizontally. One year warranty on frame. Adjusting resistance is very smooth and easy. The chain drive mechanism is quiet and seamless. Makes exercising from home or office enjoyable. Some find the seating uncomfortable. The unit only has three handlebar adjustment holes. No heart monitor, LCD or ability to track progress. 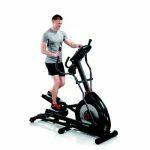 The fantastic price of this spin bike seemed to be something many purchasers raved about. While pointing out that Sunny Health lacked some features such as LCD, they explained how to get around that. Some went on to say that adding their computer or tablet display, bypassed all of these issues. All the while, saving them a huge chunk of the money that stationary cycles with those features cost. Overall, the spin bike’s frame, pricing, and deliverables make it a wise purchase. 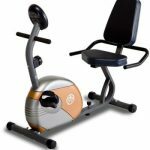 Any time people search for the best cheap stationary bikes available, the ANCHEER A5001 comes up. That’s not by accident since the manufacturer has been able to deliver quality at an affordable price. Such combination has made the belt-driven spinning bike very popular. Users can replicate high-intensity bike riding exercises such as uphill cycling. Also, the ergonomic design is sleek, exquisite and comfortable. The unit is also available in three beautiful colors; Sliver_Pulse, Black_Pulse, and Yellow_Pulse. Riders can obtain a smooth and efficient workout from the 40-pound flywheel belt drive system. The dimensions are 42.9 x 18.9 x 43.3 inches which means it takes up very little space. Unlike most spinning bikes on this listing which can only withstand 250 to 275 lbs, the ANCHEER Model A5001 has a 330 lbs capacity. It is also loaded with LCD for keeping track of speed, time, distance, total distance, scan, and calories. Users can adjust the handlebars and seat for better stability and convenience. The twist knob provides quick braking and adjustable resistance. 12-month warranty including free replacement parts. Useful LCD monitor for tracking your progress. Aesthetically pleasing with an ergonomic design. Handy bottle holder and comfy elbow trays. The seat can be adjusted horizontally and vertically. High-quality spin bike at an affordable price. Convenient wheels for quick and easy mobility. Challenging workouts with low maintenance. Stable and sturdy frame and effortless assembly. Lacks preset workout programs on the LCD monitor. Customer service is sometimes slow to respond. No SPD clips on pedals; only toe cages feature. It is straightforward to recommend the ANCHEER-A5001 spin bike based on all the positive reviews, pricing and quality. That’s why it is for people who want to obtain an effective workout from a stationary bicycle without spending too much money; it’s an easy choice. The belt drive spinning bike delivers quiet and smooth rides. Keep in mind that there are two model versions. One has an elbow tray and pulse; the other ones do not. Granted, the LCD monitor lacks some basics, and the handlebars only adjust two ways. However, for the price and overall quality, there are not too many other spin cycles which can keep up – no pun intended – with the ANCHEER A5001. The ANCHEER Indoor Cycling Bike B3008 brings the gym workout to you whether you are at home or the office. It comes with fully adjustable seating, handlebars, and pedals. That makes getting a great exercise from anywhere you want more accessible than ever. Perfect stationary bike for those who want a cost-effective piece of equipment. The design is not only ergonomic but visually stunning. The spinning bike comes in three colors and with an effective 49lbs flywheel. There are many individuals out there who desire a natural bike riding experience from a stationary cycle. But they want it to be under $500 while not compromising quality. That’s where the ANCHEER B3008 comes into play. It has a great 49lbs belt driven flywheel system. Quick stop braking and adjustable resistance come via a tension knob. The dimensions of this spin bike are 42.9 x 18.9 x 43.3 in(L x W x H). It also comes with pedals that are adjustable, with straps and toe cages. The seat and handlebars are padded, nonslip and changeable. Ergonomic design with a sturdy and balanced frame. Consistent, smooth and quiet rides via the 49 pounds flywheel. Assembly is simple and requires low maintenance. Scan function, calories burned, time, distance and speed data displayed on the LCD monitor. Equipped with two wheels for easy transport and moving. Convenient tablet and water holder included. 4-way adjustable seat; cushioned for comfort. Able to support users up to 264 pounds. Handlebars coated with rubber foam for a comfy and firm grip. The LCD monitor is small and has no heart rate measuring. Bike pedals toe cages are not dual sided. Most people want to stay fit, workout from home while saving money. That’s where this top of the line fitness spinning bike comes in. It delivers on several counts; including price, quality, features, and design. While it does lack heart rate data and preset workouts, it is still highly recommended. Users can purchase either separately without spending too much. In the end, this is a great stationary cycle that takes up very little space, delivers on workouts and is affordable. Finding positive five-star reviews of the ANCHEER Indoor Cycling Bike B3008 is effortless. That’s because there are so many of them with very little negative testimonials to counter. The positive critique from a user named Basil Horatio is a perfect example. “We love this! Very sturdy and looks great,” was how he summarized his review. A person called Adair Commons kept it short and to point stating “Love this Bike.” Then there was a verified purchaser who called himself Joseph Beck. His review read “Very happy with the purchase,” as he went into detail about why. The days of having to spend cash and time on gym memberships are long gone. People now have the option of working out from the comfort of their homes and offices. Superior indoor spinning bikes have made all of this possible. Best of all, the spin cycles on this listing are all under the $500 threshold. That makes it feasible for anyone who wants to save money and exercise at their leisure. All of the spin cycles compiled on this review and buying guide are worth considering. They are highly rated, of high quality and capable of rendering great cardiovascular workouts. Since each makes working out from anywhere so effortless, there’s never been a better time. The only thing left for anyone who wants to try one of these spin bikes is deciding when to take the plunge finally.